When I was an editor on my college newspaper back in 1993, we were just getting on email and trying to learn Pagemaker (remember that?). A traditional news organization, The New Hampshire — and the journalism professors at the University of New Hampshire — taught me solid reporting and writing skills, not to mention the protocols of vetting sources and assuming anyone who contacted us had an agenda they wanted publicity for. I remember 40-hour weeks on top of my classes — and that was without producing any video, having to learn anything as complicated as After Effects, and thinking at all about starting a buzz on Twitter. Times have changed for college news organizations. Photo courtesy of Erik Abderhalden. 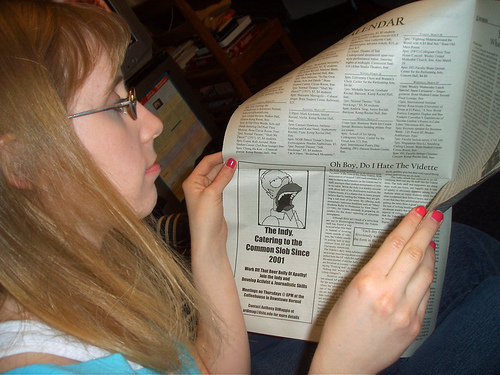 Student news organizations have traditionally existed to give students experience before entering the workforce. The kinds of journalism jobs and journalism companies have changed considerably in the past 10 years, and most student news organizations are set up to mimic traditional print or broadcast news outlets. How would you set up a student news organization in 2013 or how could an existing college news organization modernize itself?…What kinds of skills do you and your organization look for in new hires? What kind of “clips” should college students have by graduation? And a side suggestion is to think about whether it’s a good idea for college journalists to learn how to aggregate. I’d like to take up both. My schtick is “journalism as process,” advocating for a major paradigm shift among journalists and journalism educators to stop thinking about the news as a discrete product and to start considering its production and dissemination as a never-ending cycle of community dialogue among different platforms. Jeff Jarvis first coined the term several years ago (many journalists and mediawatchers have taken it up, as well) and the industry itself has been moving toward this conception. But it’s been slow to catch on among some newsrooms, some professors, and many college papers. In their Carnival posts, Jack Rosenberry emphasized digital first and multimedia, Steve Fox encouraged accurate reporting even on Twitter, and Steve Outing listed ways to be innovative. All of these pieces of advice subscribe to the notion of journalism as process. How do you do this? All of the blogs in the Carnival will have great suggestions, given the incredible breadth of experience represented in this group. You can find a round-up of them here this weekend. It’s not just about doing video with your story. It’s not just about slapping a commenting section under your articles or a forum on your site. It’s not just about pushing your stories in your social-media platforms. It’s about embracing in a real way the (actually VERY) traditional notion that journalism is about inspiring citizens so that they become more civically engaged in democracy and public life on all of its levels — politically, culturally, socially. It’s about not only informing people with the who, what, where, and why, but to provoke thought, encourage conversation, and improve our public deliberation so that we can have better government and also just be better people. We have more ways of doing that than ever before. Finally, we can move away from the letters-to-the-editor techniques of interactivity that reigned when I was at my college newspaper. We can actually offer platforms of sustained, meaningful talk and analysis that doesn’t end with the –30– of a deadline. Even — and especially — on our campuses. Become engaged as an organization throughout social media — virtual worlds — as well as campus — physical worlds. Meld the two and make use of the audience-base in both (for your entire audience is also operating in both worlds). For example, host conversations in established hashtags, extend that to some kind of panel discussion on campus with live participants and market the two simultaneously. Partner with local media organizations, particularly those who may be struggling with the “digital first” mentality. Work collaboratively on projects where your reporters can learn from the seasoned veterans and their reporters can find journalistic value in social media and multimedia through you. Experiment with figuring out new business models that are dependent on a journalism as process way of production by finding sponsors for those live chats you can do post-publication, for example, or partnering with local businesses for Foursquare or Facebook location meet-ups to discuss the story of the day. And yes, learn how to aggregate. Or better yet, curate. Part of “journalism as process” is showing audiences all the news gathering you’ve done (i.e. aggregation). It helps demonstrate that you’ve done your homework, that you have the evidence for what it is you are writing about. But it’s also about helping to organize the ensuing conversation in platforms like Storify or Facebook or Google Plus or just in your own blog on your site (curation). College news organizations operate on shoe-string budgets with staff that are always turning over. They do herculean work, given their constraints. But they also represent the first real-world testing lab for a bunch of brand-new, eager reporters who hope to get jobs in the industry. They can change things, having used their college experience to experiment with different forms and concepts of storytelling. They will change things — as long as they break out of the rut of traditional thinking. We know it when we see it: a beautifully composed, striking photo. But how can we define good photography, and more importantly, what guidelines can storytellers follow to help ensure high quality images in our multimedia pieces? The type of story you are doing can dictate the type of photos to include. In chapter four of Photojournalism: The Professionals’ Approach, Kenneth Kobre tells us that news and features can be differentiated like this: a news story is about a famous person, important event, or a tragic outcome. A feature story on the other hand is a slice of life story. Digital Photography School offers some great suggestions for taking unique portraits, including one of my favorites: altering the perspective of a photo (avoiding taking a photo at eye level and trying out unusual angles). Tying these carefully thought out photos into an audio slideshow adds another element of difficulty. Photos need to be arranged well to tell a compelling story with a beginning, middle, and end. Audio must also drive the story and should be created first with photos added later. Some great examples of strong audio slideshows can be found in the 1 in 8 Million series by the New York Times. My personal favorite is Christian Hubert: The Bridge Bicyclist. Although the story is somewhat weakened by our lack of understanding why Hubert insists on riding his bike, the photos display many rules of good composition and work together to tell a story that has a clear beginning, middle, and end in under two minutes. How do you ensure you take good photos? What rules of composition do you follow? Karen Hess is a MA professional-track journalism student in the University of Wisconsin-Madison’s School of Journalism & Mass Communication. I will occasionally post entries from students in a storytelling class I am teaching right now. edUtopia Wisconsin is a collaborative final project for 30 students enrolled in Intermediate Reporting in the University of Wisconsin-Madison’s School of Journalism and Mass Communication. Instead of rehashing the problems facing Wisconsin’s educational system—both K-12 and higher education, this project seeks to advance the conversations happening in society in order to provide fodder for a dialogue about possible solutions. For these pieces, students researched and investigated the existing challenges, interviewed more than 100 experts, teachers, principals, superintendents, parents and students, and brainstormed solutions to these problems. Many of the stories highlight innovative and forward-thinking programs and initiatives throughout the state; some pose a conversation about the ideal. In four topical areas — Education Costs, Today’s Student, the Utopian Classroom and Benchmarks— this website offers a positive frame for rejuvenating and improving the academic life of our children. In our Project Blog, you will find student thoughts on the whole process as well as material we could not fit in the stories. Students Rebecca Smith and Vince Huth, both Class of 2013, served as our incredible Webmasters. If you have questions or suggestions, please contact either Robinson (robinson4@wisc.edu) or Walters (swalters@facstaff.wisc.edu). If you have comments, we’d love to hear from you in any of the commenting sections provided under the stories. If you like it, please share the url (http://sites.journalism.wisc.edu/edutopia/) with others via Twitter, Facebook, Delicious, your blog or any other social-media platform! I think the students did a wonderful job! Congratulations!! I know I keep hammering on this, but check out this Associated Press article (“Employers Turning to Facebook”) re. Facebook and your expectation of privacy as you search for a new job. Will you tell the company no? I am not suggesting an answer either way, as I think it’s a decision everyone must make for themselves. I AM suggesting that you think carefully about your activities in college and what you want to do after graduation.